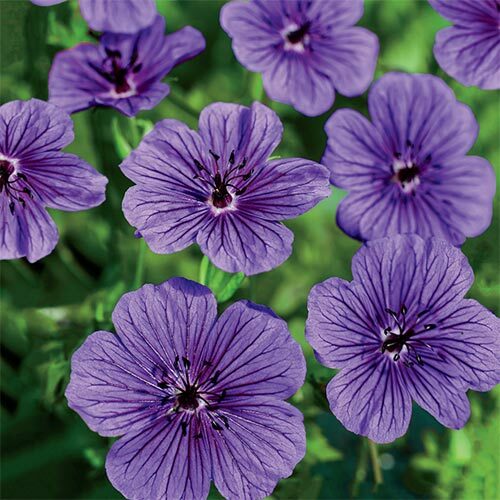 Light purple, 2", cup-shaped blooms with deep purple veining. 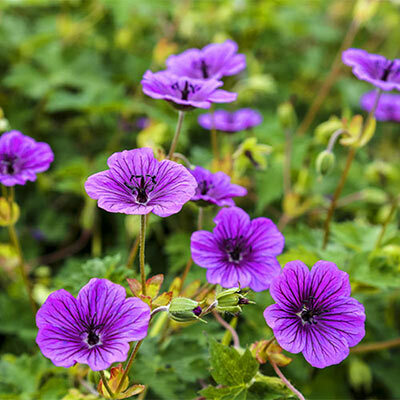 Low-growing mounds of dark green leaves topped with colorful blooms make geraniums an unequaled addition to the perennial border. They continue to gain popularity among gardeners who are looking for low-maintenance plants. Not only do they produce lovely flowers in a wide variety of colors, but they also have varied growing habits to suit gardens in almost any climate. Rounded, palmate lobed foliage is deep green, marbled in spring turning to shades of bronze in fall. Top of plant should be just below the soil. Plant 24" apart. None, but if plants look untidy you can cut the plants back completely and within 2-3 weeks you will have a fresh looking clump with flowers again.